Born September 29, 1871, at Trethurgy, Cornwall. Died June 17, 1925, at Torbrook Mines, Nova Scotia. "Your father left England a few years before we did. Bill, Jennie, Fred, and Frank were all in Canada before the family; in fact, Frank came home and got Father and Mother to come to Canada. I was nine years old and born in 1883, so I make it the summer of 1892. I don't know what month, and we went direct to Capleton two weeks after the mine closed down, and your father and Bill Rice went to Nova Scotia. Your dad was married and a baby expected when we came to Canada. I hope this will help you out. I don't remember much about the trip over. Ruby's father came on the same boat--he was Alice's beaux in England." Alfred and Will Rice went to Torbrook Mines, Annapolis Valley, Nova Scotia, to work in a new mine. 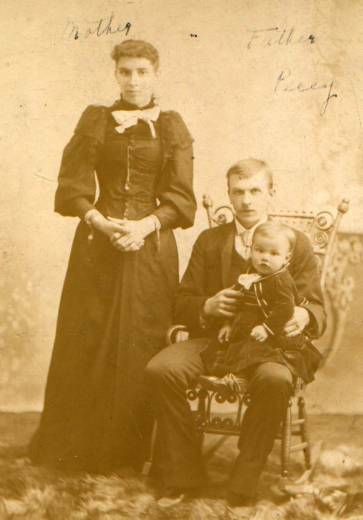 He married Elizabeth Jane ("Janie") Hambly (b. September 29, 1871, at Trethurgy, Cornwall; d. June 17, 1925, of cerebral hemorrhage; buried at Torbrook Mines, Nova Scotia) in June, 1893. Alfred's two big interests were politics (he was a Conservative) and religion. He went to South Mountain, with others, to get lumber to build the Methodist Church at Torbrook Mines, Nova Scotia. He planted apple trees on the property at Torbrook. He was very strict with his sons-- taking them out to the barn to whip them when they did something wrong. In those days, there were no drying facilities at the mine-- each morning, the men would put on wet clothes from the day before. This was too much for Alfred. He developed miner's consumption, and died. At the time, Frank was less than a year old, and Isabel was two. Alfred said "I don't fear death, but I hate to leave mother with seven children living in a mining area." Alfred died and was buried in the Hambly burial plot at Wilmot, Nova Scotia. 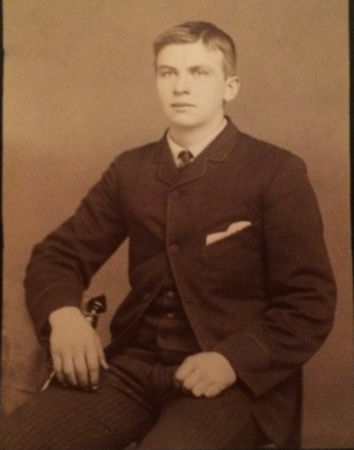 Percy Lisgar Hansford (b. January 19, 1894, in Torbrook Mines, Nova Scotia; d. June 6, 1913, of influenza; buried in Torbrook Mines, Nova Scotia). Albert Vernon Hansford (b. January 20, 1897, in Torbrook Mines, Nova Scotia; d. December 6, 1917, of war wounds). Cecil Hambly Hansford (b. February 3, 1899, in Torbrook Mines, Nova Scotia; d. January 2, 1964, of an aneurism of the aorta). Ralph Sponagle Hansford (b. February 6, 1901, in Torbrook Mines, Nova Scotia; d. February 11, 1968, of arterial sclerosis; buried in York Cemetery, Toronto). Isabel Lorna Hansford (b. December 15, 1903, in Torbrook Mines, Nova Scotia; d. January 7, 1995, at Burbank, California; buried at Randolph, New Jersey). Frank Stanley Hansford (b. October 12, 1905, in Torbrook Mines, Nova Scotia; d. February 24, 1985).